During the game today I decided to Tweet some thoughts as the game played out. San Francisco starter Ryan Vogelsong walked the first two batters he faced in the 4th inning and Michael Saunders came to the plate with the Mariners down 2 - 0. In these types of situations, the Mariners have been exceptionally good at leaving runners stranded and not scoring any runs. Hence the less than 2 runs we have averaged per game on this home stand. With Kyle Seager on second and Jesus Montero at first, Saunders needed to put the ball in play and at a minimum advance the runners 90 feet. This is the way baseball should work in my mind. Instead, Saunders hit a line drive that was caught by right fielder Gregor Blanco and nobody was able to advance. Justin Smoak was up next and like clockwork, he hit into a double play to end the inning. @LarryLaRue: Would you have bunted with Saunders? @LarryLaRue: That's part of baseball's allure - lots of options, lots of opinions. @MesaTitan: Yes, because bunting with your best hitter is a smart thing to do. 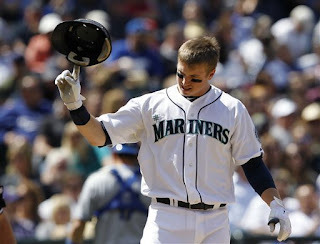 Twas bad luck, and Smoak being a PoS, nothing more. ME: you have to remember, our best hitter if still hitting less than .280. @MesaTitan: Well yes, if you still live in the 90's and judge batters solely on batting average. ME: what else would you like to look at? @MesaTitan: wOBA, wRC+, OPS, OPS+, many things. ME: I do recall Saunders hitting first in the lineup under 2 weeks ago too. It would have been okay then, right? @MesaTitan: No. Bunting is for pitchers, Brendan Ryan, and Chone Figgins. Not your best hitter. Easy to judge after the fact. @MesaTitan: Ok with him bunting? No, I'm never ok with him bunting unless it's with the bases empty and he's going for a hit. ME: and the M's still have no runs, weird. @MesaTitans: So you want to give away outs? GENIUS! ME: you always have a difference of opinion to me, that's fine, but to act like you don't know anything about small ball?????? ME: you should read my article from the other day. Facts you should know about Safeco Field. May change your mind. @MesaTitan: Sorry, no offense, but I do not care to read anything that supports giving away outs to move runners up. ME: that's not what it's about, but oh well. I don't care either. I stopped replying as I realized that some people just like to argue more than converse and when there is an unwillingness to listen you're just wasting your time. I didn't ever think that I would win @MesaTitan over, but I was having a really hard time believing that anybody would discount the merit of small ball. Baseball has been played for over 100 years and small ball is still a large part of every team. Lou Piniella, the last manager that had this team winning played that way. He did whatever he needed to do to put runs on the board. He did things right. I understand that the beginning of this debate was specifically about Michael Saunders bunting. Why would I have chose to bunt Saunders? At this stage of the Mariners home woes, I would have chose to bunt anybody and everybody in this situation. Lay it down, maybe even get a hit, but to just get out did nothing. Hind sight now, I understand that. If Saunders would have got a hit we would have been singing his praises, but he didn't. In fact, no Mariner has been able to get this job done on this entire road trip. Michael Saunders, our best hitter? He currently has the best average. He has hit well. Average being a stat of the 90's? That's actually a stat that shows how many times Saunders gets a hit per how many at bats he has. If he's looking for a hit in that situation, which he was, then he has less than 28% chance to get a base hit. To put a bunt down and move the runners over, should happen every time. Right now, even the Mariners could screw that up. Saunders is only hitting .230 in his last 7 games. We need to take the blinders off as Mariner fans. We hold up some of these players in such high regard, but if you take a look at what were talking about, our best player only has a .271 AVG. Our rookies that we call the future of this franchise and celebrate with their own bobble head nights are all hitting below .250 and are getting worse, not better. Other teams are calling up hitters from AAA teams that have made a name for themselves because of what they do at the plate, not just because they're talked about in high regard. The Mariners have got to do something different and if that means manufacture a run here and a run there, let's do it. Michael Saunders is not the type of player that we should refuse to have bunt. He's not a threat to anybody, and at .271 he surely doesn't cause any fear in the hearts of the pitchers he faces. Tonight's game was a perfect example of small ball working for the Mariners. In fact, both instances refer to Saunders coincidentally. In the second inning, Jesus Montero hit a lead-off double. Then it was Saunders at the plate. He could have bunted Montero into scoring position, but instead he swung away and lined a ball to Angel Pagan in center and Montero was doubled off at second base. That's two games in a row Montero has been doubled off at second from the outfield. I have no idea how that happens. If Saunders would have sacrificed Montero over, Justin Smoak would have had a sac fly in his next at bat rather than an inning ending flyout. Mariners would have been tied 1 to 1. In the 4th they would have tied 2 - 2 and tied again in the 8th at 4 to 4. Our two runs we did get in the 8th were on two ground balls that should have both been double plays but were miscued by the Giants and brought home a run each. This game could have very well been a shutout. So, needless to say, I don't believe that anyone on our team is above a sacrifice bunt. It seems that Eric Wedge is unwilling to relent to this style of play, but it's what works at Safeco Field. Can we hit homeruns? Sure. Do we? Yes. That will still happen when mistakes are made, but when we have the perfect opportunity to manufacture a run, let's take it. Today, not doing the little things that have helped teams win for over 100 years cost us this game. We could have won it in the 9th, we could still be playing. Instead, we're debating how things could have been or should have been. I just can't wait until the day that they actually WILL be. Until then, when runs are scarce, MANUFACTURE!